The Cell Calendar for Excel is an Excel add-in which, when installed, allows to easily work with dates in Excel workbooks and templates. 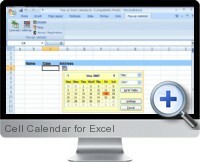 The Cell Calendar for Excel can be activated in two ways - automatically or manually. In automatic mode the The Cell Calendar for Excel can save a considerable amount of time when working with date related data. Has a date value. For example, if a cell is formatted as date but has a date like value, The Cell Calendar for Excel will display the cell icon button when you click the cell. Underneath a cell with a date value or format. Underneath a cell that has some form of the word date.